Can I Get Health Insurance After Open Enrollment? There are a great number of people that believe they can sign up for health insurance whenever they need to because of health care reform. Polls have shown that 55% of Americans don’t know that the open enrollment period ends on March 31st. Media outlets (aka newspapers, and magazine sites) are not helping, and are sometimes a source of horrible mis-information. There are only a few qualifying events that will allow you to get health insurance after open enrollment. We’ll show you what those are, and how you can make use of them to sign up for coverage. Make no mistake, you can not enroll to get health insurance after 3/31 unless you qualify for an exception. Major publications, and media sites have made the mistake of saying you can. Don’t be caught off guard about the consequences of missing the deadline. After March 31, consumers looking to purchase plans through the marketplace won’t be able to do so until open enrollment begins again in October. If you miss the deadline, you can purchase insurance outside of the marketplace at any time – but be aware that you won’t receive any premium subsidies (think “discounts”), and you will likely be subject to a penalty for the time you were uninsured. March 3, 2014 – Article in US News online. This is WRONG! If anyone could sign up at any time, then health insurance costs would be significantly higher. Massachusetts tried this when their “Obamacare” plan was introduced a number of years ago. What some people did was wait until they needed care, and then they signed up for health insurance. Once they were healed, they dropped the coverage. The insurance companies quickly increased the premium costs for everyone to compensate for the people that were abusing the system. Obamacare avoids this problem by having an open enrollment period. Once the window closes, there are only selected situations that allow someone to enroll for coverage. These are called Qualifying Events, and create a Special Enrollment period. A special note for number 1 above is that you can not cancel your existing plan, or lose coverage by not paying the premium, and then sign up for new health insurance. The qualifying events that will occur most frequently are having a baby, getting married, losing group or COBRA coverage, becoming naturalized, or having an income change that makes you eligible for subsidized coverage using premium assistance tax credits. If you forget to enroll for coverage during the open enrollment period, know that it will be much harder to get health insurance after open enrollment. Sign up before 3/31. Should one of the qualifying events happen later this year, then contact us and we’ll help you through the paperwork to enable your special enrollment period, and prove the existence of your qualifying event. For everyone else, we’ll talk to you between November 15, 2014 and February 15, 2015 during the next open enrollment period for plans that start on January 1st, 2015. 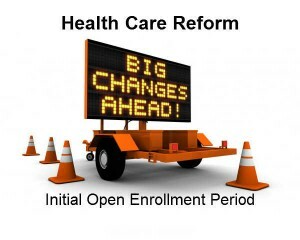 Go to the Obamacare Impact On Families And Individuals page.